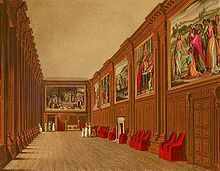 Hampton Court Palace is a royal palace in the borough of Richmond upon Thames, 11.7 miles (18.8 kilometres) south west and upstream of central London on the River Thames. Building of the palace began in 1515 for Cardinal Thomas Wolsey, a favourite of King Henry VIII. In 1529, as Wolsey fell from favour, the cardinal gave the palace to the King to check his disgrace; Henry VIII later enlarged it. Along with St James's Palace, it is one of only two surviving palaces out of the many owned by King Henry VIII. There are also ten statues of heraldic animals, called the King's Beasts, that stand on the bridge over the moat leading to the great gatehouse. Unlike the Queen's Beasts in Kew Gardens, these statues represent the ancestry of King Henry VIII and his third wife Jane Seymour. The animals are: the lion of England, the Seymour lion, the Royal dragon, the black bull of Clarence, the yale of Beaufort, the white lion of Mortimer, the White Greyhound of Richmond, the Tudor dragon, the Seymour panther and the Seymour unicorn. The set of Queens Beasts at the Coronation of Queen Elizabeth II replaced the three Seymour items and one of the dragons by the griffin of Edward III, the horse of Hanover, the falcon of the Plantagenets and the unicorn of Scotland. From the 1760s, the palace was used to house grace and favour residents. 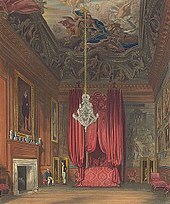 Many of the palace rooms were adapted to be rent free apartments, with vacant ones allocated by the Lord Chamberlain to applicants to reward past services rendered to the Crown. From 1862 to his death in 1867, Michael Faraday lived there. From the 1960s the number of new residents declined, with the last admitted in the 1980s. However existing residents could continue to live there. In 2005 three remained, with none by 2017. ^ Law, Ernest Philip Alphonse (1890-01-01). 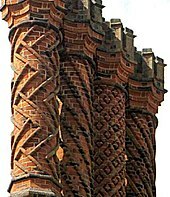 The History of Hampton Court Palace. George Bell and Sons. ^ "James VI and I (1566–1625)". www.encyclopediavirginia.org. Retrieved 2017-01-26. 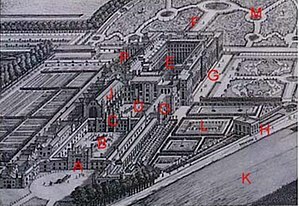 ^ London2012.com Archived 30 May 2012 at the Wayback Machine..
Hampton Court as seen by John Evelyn. Charles [II] preferred Windsor Castle, but sometimes came to Hampton Court for the day to attend royal council meetings. He also built a set of lodgings at the south-east corner of the palace for his mistress, Lady Castlemaine. These new rooms were totally different from the Tudor gothic architecture of Henry VIII's day and heralded a move towards the style favoured by William III and Mary II. "Charles [II] preferred Windsor Castle"
and revelled here in the blood of the royal party, as he had done in that of his sovereign. King Charles II. 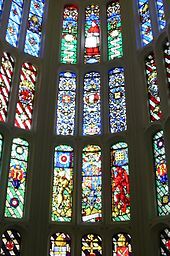 therefore chose Windsor, and bestowed a vast sum in beautifying the castle there, and which brought it to the perfection we see it in at this day--some few alterations excepted, done in the time of King William." Dicet, Ibi Reges, hic habitare Deos. If e'er a Briton what is wealth don't know; let him repair to Hampton Court, and then view all the palaces of the earth, when he will say, Those are the residence of Kings, but this of the Gods. 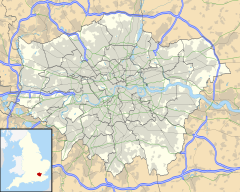 ---London and Its Environs Described. R. Dodsley, 1761.